Whenever another character discards or flips a judgement card into the discard pile that is a club, Cao Zhi can immediately place this card into his hand. When Cao Zhi is face up, he can choose to flip face down to use Wine (applicable situations only). When Cao Zhi takes damage when he is face down, he can flip face up. "Fallen Bloom" does not allow Cao Zhi to take club cards that are 'used' by other players. For example, if one player Attacks another player with a club-suited Attack, Cao Zhi cannot pick up this card. Also, character abilities that allow a character to 'use' club cards as other cards are treated in a similar manner. For example, if Yuan Shao uses two club cards to use Hail of Arrows as per "Random Strike," Cao Zhi does not get to place these cards into his hand. Cao Zhi does not take possession of exchanged Chains or cards used during 'compete' via "Fallen Bloom." Cao Zhi cannot take possession of his own discarded club-suited cards via "Fallen Bloom." When another character replaces a piece of equipment that is of the suit of clubs, Cao Zhi can take it via "Fallen Bloom." 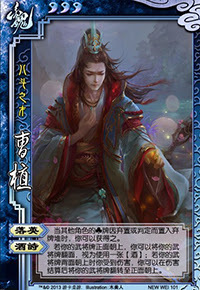 Cao Zhi can take possession of a card that was discarded by Break with "Fallen Bloom." "Fallen Bloom" also applies to cards with discarded in the four following situations: cards discarded to activate powers, cards discarded in the discard phase, cards discarded when a player dies, and judgement cards flipped into the discard pile. Guo Jia, Yan Liang & Wen Chou, Zhen Ji, and Deng Ai have powers in which they can flip judgment cards that they keep. 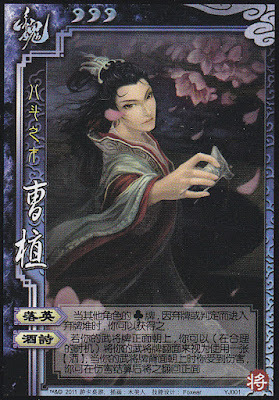 Cao Zhi cannot use "Fallen Bloom" to 'usurp' these character's abilities, as his power only refers to judgment cards flipped into the discard pile. Xiahou Dun Unyielding Cao Zhi can keep Xiahou Dun's judgement card when he activates "Unyielding" if it is a club. Furthermore, if the target (assuming it is not Cao Zhi) chooses to discard club-suited cards from their hand to avoid damage, Cao Zhi can take possession of these cards too. Xiahou Yuan Godspeed When Xiahou Yuan discards a club-suited piece of equipment to activate the second option of this power, Cao Zhi can take possession of this card. Dian Wei Assault When Dian Wei discards a club-suited piece of equipment to damage another character, Cao Zhi can take possession of this card. Zhang He Clever Change When Zhang He discards cards to skip phases of his turn, Cao Zhi can take possession of these cards if they have a club suit. SP Cao Ren Break Through SP Cao Ren must discard X cards at the beginning of his next turn if he uses "Break Through." Cao Zhi is entitled to the clubs that SP Cao Ren discards in this fashion. Wang Yi Secret Plan If Wang Yi flips a club-suited judgement card for this power, Cao Zhi can place it in his hand. Xun You Wisdom and Foolishness If a character that damages Xun You discards a club-suited card as per this ability, Cao Zhi can acquire it immediately. Ma Chao Iron Calvary If Ma Chao flips a club-suited judgement card for this power, Cao Zhi immediately takes possession of it. Pang Tong Nirvana When Pang Tong revives himself via this ability, he must discard all of his cards. Cao Zhi can take all of the club-suited discarded cards. Younger Zhuge Liang Eight Arrays In the same way that Cao Zhi can keep club-suited judgement cards from the Eight Trigrams armor, Cao Zhi can keep the club-suited judgement cards that Younger Zhuge Liang flips for this power. Ma Su Bottomless Tears A character that kills Ma Su must discard all of their cards. Cao Zhi can acquire the club-suited cards. Xu Shu Recommendation Cao Zhi can acquire the club-suited cards that Xu Shu discards when he uses this ability. Revamped Xu Shu Recommendation Cao Zhi can acquire a club-suited non-basic card that Revamped Xu Shu uses to activate "Recommendation." Liu Shan Decentralization If Liu Shan skips his action phase and discards a club-suited card from this hand, Cao Zhi can acquire this card. Ma Dai Sneak Attack Like Ma Chao, if Ma Dai flips a club-suited judgement card for this ability, Cao Zhi can acquire it. Sun Quan/Demigod Sima Yi Checks and Balances When these characters discard clubs to draw new cards, Cao Zhi is entitled to take the club-suited cards. Da Qiao Displace If Da Qiao discards a club-suited card to redirect an Attack to a new target, Cao Zhi can keep the discarded club. Sun Shang Xiang Marriage When Sun Shang Xiang discards two cards to heal herself and a damaged male, Cao Zhi can take these cards if they are club-suited. Sun Jian/Sun Ce Brave Spirit This power allows these characters to select a player to draw and discard cards. The discarded clubs can be acquired by Cao Zhi. Lu Su Alliance Lu Su can discard cards to force characters to switch hands. If Lu Su discards club-suited cards to do this, Cao Zhi can acquire these cards. Hua Tuo Green Vesicle If Hua Tuo discards a club-suited card during his turn to heal a character, Cao Zhi can immediately take possession of this card. Diao Chan Sow Discord Diao Chan must discard a card to make two men duel. If the card is of the club suit, Cao Zhi can take possession of it. Zhang Jiao Lightning Strike "Lightning Strike" allows Zhang Jiao to pick a character and make them flip a judgement card. If this card is of the suit of clubs, Cao Zhi can take possession of it. Cai Wen Ji Lament Cai Wen Ji can discard a card and flip a judgement card when someone is damaged by an Attack. Cao Zhi can keep either of these cards if they are of a club suit. SP Diao Chan Soul Surrender SP Diao Chan must discard a card to steal all of a male's hand cards. If this card is a club, Cao Zhi can acquire it. Demigod Guan Yu Fighting Soul If the judgement card that determines the fate of Guan Yu's victim is club-suited, Cao Zhi can acquire it. Demigod Zhou Yu Searing Flame If Zhou Yu discards one card of each suit to deal more than one unit of fire damage to one person, Cao Zhi can keep the club-suited card. Demigod Lu Bu Divine Anger When Lu Bu activates this power, all characters must discard their hand cards and equipped cards. Cao Zhi is entitled to all club-suited cards discarded in this fashion. If Cao Zhi uses "Wine Poems" during his turn, an Attack used afterwards will deal an additional unit of damage if it hits (this works in the same way as using Wine then Attack). Cao Zhi can use "Wine Poems" when on the brink of death if he is flipped face up (this works the same way as using Wine when on the brink of death). If Cao Zhi is on the brink of death when face down, he cannot use "Wine Poems" to save himself. Remember, Cao Zhi can only flip to use Wine if he is flipped face up. If Cao Zhi is saved by some other means in this situation, however, he can flip back face up after being saved. "Fallen Bloom" opens up many opportunities for teamwork between Cao Zhi and many characters. This power also works well against opponents who do not pay attention to what they discard. "Wine Poems" is wonderful offensively and defensively. It allows Cao Zhi to Attack with Wine much more frequently than the average character and it also helps him to survive with one unit of health remaining. If Cao Zhi or one of his teammates has a Peach in their hand, Cao Zhi can can take three hits before dying. On the first hit, Cao Zhi would flip face down to use Wine. In the second hit, the Peach is used and Cao Zhi is flipped face up. On the third hit, Cao Zhi flips back face down. The fourth hit would kill Cao Zhi at this point. All Cao Zhi needs to do is survive to his next turn so he can flip back face up so he can flip and use another Wine. "Wine Poems" helps Cao Zhi when he is flipped face down. He is the only official character that can turn face up when flipped face down without waiting for the next turn. This gives him a defense against enemy characters trying to Attack him when he is flipped face down, as he can flip back face up when he is damaged. It is easy to not pay attention to the discarded cards when using Cao Zhi, so many club-suited cards can fall by the wayside and instead of into your hand via "Fallen Bloom." "Fallen Bloom" is wonderful, but Cao Zhi cannot obtain Escapes from this ability. This is a problem because when Cao Zhi has one unit of health and no Escapes, it is easy for an enemy to keep him in 'purgatory' by simply attacking him each round and forcing him to flip to get Wine via "Wine Poems." Most enemies will be careful not to discard club-suited cards to prevent Cao Zhi from activating "Fallen Bloom." "Wine Poems" needs to be used effectively to prevent reaching one unit of health too quickly. Even though the threat of flipping back face up when flipped face down may be enough to prevent some players from damaging you, it is necessary to realize that taking damage to flip back is not always a good thing. If a Cao Zhi character is too careless with this ability, they can find themselves at one unit of health remaining very quickly. Cao Zhi is still difficult to kill, he is a lot less effective if he is forced to play defensively. For a list of capable allies that work well with "Fallen Bloom," see the character list in the 'Clarification' section. Some characters have powers that will help Cao Zhi more often than others. For example, Sun Quan and Xu Shu will be able to give Cao Zhi club-suited cards more often than Demigod Guan Yu, as these characters have powers that allow them to discard club-suited cards every turn, while Demigod Guan Yu may be able to force the character who caused him the most damage a judgement card with a 1/4 chance of this single judgement card being a club. Use discretion when choosing a teammate to Cao Zhi. Sima Yi/Zhang Jiao - These characters are judgement tinkers. They can 'pass' Cao Zhi club-suited cards by changing judgement cards to club-suited cards in their possession. Zhen Ji - Although Cao Zhi cannot steal the club-suited judgement cards of "Goddess Luo," Zhen Ji can choose to not uses these cards and simply discard them at the end of her turn, allowing Cao Zhi to place them in his hand via "Fallen Bloom." Zhang Zhao & Zhang Hong - Cao Zhi can keep all discarded club-suited cards. He probably will not be able to use all of these cards at the end of his turns, so Zhang Zhao & Zhang Hong can use "Stubborn" to pick up these cards after Cao Zhi discards them. Then, Zhang Zhao & Zhang Hong can discard these cards to 'pass' them back to Cao Zhi, repeating the cycle. Cao Pi - Cao Pi and Cao Zhi can be excellent teammates or bitter rivals. If they cooperate, they are very powerful together. Cao Pi's "Exile" can flip Cao Zhi face up if he is face down from using "Wine Poems." Additionally, when Cao Pi is low on health, he can flip Cao Zhi face down when he is face up without worrying too much about Cao Zhi losing his next turn, as it would not be hard for Cao Zhi to take damage from Barbarians or Hail of Arrows and flip back face up. If these two are enemies, Cao Pi can cause some problems for Cao Zhi. Cao Pi's "Unnatural Death" allows him to take all of a dead player's cards before they fall into the discard pile, robbing Cao Zhi of club-suited cards via "Fallen Bloom." Also, if Cao Zhi is low on health and Cao Pi flips him face down with "Exile," he effectively robs Cao Zhi of the opportunity of using Wine, and hence reduces his likelihood of surviving. In practice, however, Cao Zhi usually seems to have the advantage over Cao Pi if the two are on opposite teams. Ma Dai - Ma Dai's "Sneak Attack" allows him to reduce Cao Zhi's maximum health limit instead of dealing damage to him. If Cao Zhi is flipped face down when this happens, he cannot flip back face up, as he technically does not take damage when this happens. If Ma Dai is able to reduce Cao Zhi's maximum down to zero, he dies without his amazing "Wine Poems" defense. King Cao Zhi is a good king choice. "Wine Poems" is a very good defensive power and it can prolong Cao Zhi's life. Keep in mind though that with multiple rebels trying to kill him, it is possible that they can overwhelm him before he gets a chance to flip face up on his next turn. The advantage of choosing Cao Zhi as a king though is that the loyalists can choose characters that can more easily pass Cao Zhi club-suited cards via "Fallen Bloom." Loyalist Cao Zhi can be a very good loyalist, especially if Cao Pi is the king. As mentioned in the 'Notable Combinations' section, these two work very well cooperatively. If Cao Pi is not the king, Cao Zhi can still be a good loyalist, but he must be more careful with using "Wine Poems." If he uses this power too much and does not receive damage before his next turn, he loses turns. This can be problematic if the king is at low health and Cao Zhi is losing turns to help fight the rebels. Rebel Cao Zhi is a good rebel. "Wine Poems" gives him a boost when Attacking the king and it also gives him additional protection when he is low on health. This is particularly useful when the loyalists are trying to kill him. Spy Cao Zhi is a very good spy. "Wine Poems" can allow him to turn the tides of battle if one side has too much of an advantage over the other. Also, if the rest of the players realize he is the spy, they will probably not pursue him as aggressively as they normally would. "Wine Poems" keeps him alive for a long period of time and it does not matter as much if he loses turns as the spy since he is not as responsible for keeping other characters alive as the other roles are. Cao Zhi is a very powerful character. Both of his abilities are solid. Keep a very close eye on the discard pile and pick up all of the club-suited cards that you possibly can. All too often the cards will slip out of Cao Zhi's grasp when he is controlled by an inattentive player. Also, use "Wine Poems" carefully. Using this power to make an Attack more powerful can be a good move, but you must keep in mind that you will lose your next turn unless you are damaged beforehand. It is easy for Cao Zhi's health level to decrease more quickly than expected if playing in a risky manner like this.